First on a Personal Note, I want to wish all my readers and all of the Inspy Romance readers a very Merry Christmas & a Wonderful, Happy & Prosperous New Year!!! May all your holidays be bright, beautiful & filled with the love only God can give! The longer I live and the more I write, the more I realize that life is a process not a destination. I think a lot of us expect life to be about the destination. When it’s not, I think we become frustrated and feel like there’s something wrong with us or that life is just not fair. The full weight of my shift in belief in this area hit me the other day when I was final reading my newest release, “Little Drops of Sunshine.” If ever there was a process book, it’s this one! It’s interesting because in the book the two main characters, Lauren and Wes, actually probably like each other in the previous book (that’s about two different characters). They are best friends with Paige and Nelson, and so they end up hanging around each other quite a bit. He’s one of those hopelessly obnoxious guys who can’t be serious to save his life. She is fun-loving, but she’s been compared her whole life to a perfect older brother, so she feels less-than in most every situation. Neither of them “know” how to do a relationship, and they’re both terrified of being real with the other about what they’re feeling. However, when the chips are down, they are there for each other—not as romantic partners but as real friends. So you get a whole book about the process of growing up and what love looks like when it’s not microwaved. This thing is more like a delicate soufflé that can’t be rushed. As the book goes, these two are together and then not, together and then not. And, at least for me, it’s easy to begin to see just how natural life is when they are together and how ridiculous it can get when they are not. I think that’s the real process of falling in love. It’s not about how impressive you can be. It’s about who can you be really, truly real with? Who is there for you when life kicks you in the teeth? Who doesn’t take off when you do something really dumb? Who walks beside you, wants the best for you, and does what they can to make that happen? The more I write this series, the more I think the whole thing is about the process, and it’s not a short one with these people either. A couple of them make some really dumb (albeit realistic) choices that spiral destination thinking into oblivion. So if you’re into learning about the process and growing with characters through it, this might be a journey you end up really enjoying. I will, however, warn you that the process is not always so simple as: they meet, fall madly in love, they kiss, the end. To Read “Little Drops of Sunshine” Click here! Hi Staci, thanks for your thoughts. I think it is too easy to mistake the fluffy love with the real life stick with it love- I like how you put it, who is there in the tough times. I hope that you have a wonderful Christmas and a happy new year. Thanks so much for stopping by, Wemble! I hope your Christmas is filled with hope and joy and peace! Hi Staci! Inspiring thought provoking thought. I agree life is a processes and is never simple. Merry Christmas and Blessings for the New Year. Each day brings its own lessons! Merry Christmas to you and your family as well! Thank you for sharing your story, it sounds really interesting! Thanks Paula Marie! Blessings at Christmas & the New Year! Merry Christmas Staci and all the Inspy Romance family! 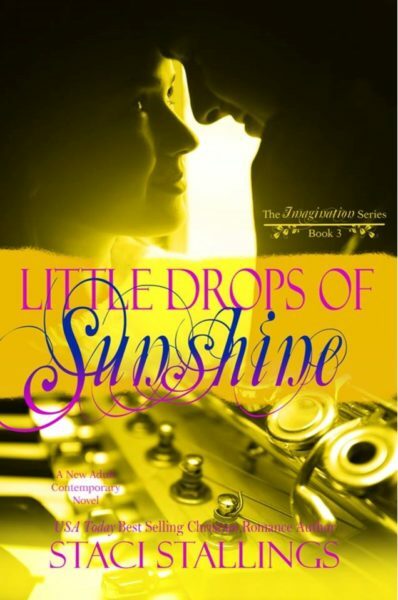 “Little Drops of Sunshine” sounds like a good book in a good series. I haven’t read any of them yet but I’m happy to see they’re available through kindle unlimited so they’re all in my TBR list now. I read “If You Believed in Love” this past summer and I gave it a 5 star review. I save that rating for the best books, not just the good ones so I really did enjoy it. Thanks for the compliment and the review on “IYB” Sherri. That is still one of my favs too. I can just get lost in that book! Anxious to read your books, Staci…..will check on that early next year! Love your post! Merry Christmas to you and your family….as well as all commenters here! Thanks, Jackie! I’m looking forward to the New Year as well. Lots of plans, but realizing I’ve got to get going on them or it will be Christmas again before I know it! Peace, Love, & Joy for your Christmas season & the new year beyond! Thanks LucyReynolds! Merry Christmas to you as well! Merry Christmas!! Most everything is the process and the destination is the fun bonus of it all! Thank you for sharing. Thanks so much for stopping by, Susan! Have a wonderful Christmas season! Merry Christmas!! We’re enjoying family. A blessing to be together. Absolutely! That’s why I’ve been so remiss in getting my replies done! Wow, let’s so true when you think about it…you understand it when you get older, can’t agree more. The book sounds wonderful! Thank you for sharing! Thanks for stopping by Natalya! Have a blessed and Merry Christmas!